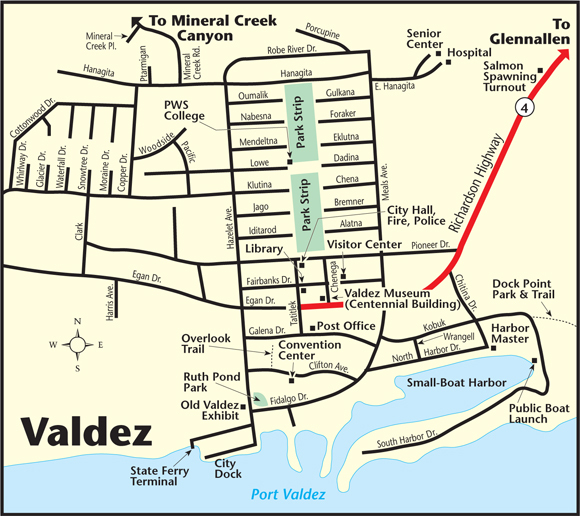 Valdez (pronounced val-DEEZ) is located on Port Valdez, an estuary off Valdez Arm in Prince William Sound. Valdez is 115 air miles from Anchorage; 304 highway miles (about a 5-hour drive) from Anchorage; and 366 highway miles from Fairbanks. Visitor Information: Valdez Convention and Visitors Bureau is located at 309 Fairbanks Dr.; phone 907-835-2984 or email. Often called Alaska’s “Little Switzerland” because of its mountain setting, Valdez is the southern terminus of the Richardson Highway from Fairbanks and the trans-Alaska pipeline from Prudhoe Bay. Valdez was established in 1897–98 as a port of entry for gold seekers bound for the Klondike goldfields. The old gold rush trail out of Valdez was developed into a sled and wagon road over Thompson Pass in the early 1900s, eventually becoming Alaska’s first automobile road—the Richardson Highway—in the early 1920s. Until 1964, Valdez was located about 4 miles east of its present location, closer to Valdez Glacier. The 1964 Good Friday earthquake, the most destructive earthquake ever to hit southcentral Alaska, measured 9.2 on the Richter scale and was centered in Prince William Sound. The quake did not destroy Valdez but the series of local waves caused by massive underwater landslides swept over and engulfed the Valdez wharf taking 33 people with it. Seismic action shook the downtown and residential areas. Though much damage was sustained, only the waterfront was destroyed. After the quake, the Army Corps of Engineers determined the town should be relocated. By late August 1964, relocation was underway. The last residents remaining at “old” Valdez moved to the new town in 1968. Valdez has motel/hotel facilities such as Downtown B&B Inn, Eagle’s Rest RV Park & Cabins, Keystone Hotel, and several other private RV parks such as the Bear Paw RV Park and Bayside RV Park and the Valdez KOA. Summer reservations are advised. Services here include restaurants, 2 supermarkets, a sporting goods store, gas stations, liquor store and gift shops. Acres Kwik Trip phone 907-835-3278 is a gas/convenience store/deli/laundromat combo conveniently located on the edge of town. The waterfront in Valdez is set up to accommodate fishermen as well as visitors out for a stroll. The public promenade offers fine views of activity in the Small Boat Harbor. Take a boat tour to see Columbia Glacier, second largest tidewater glacier in North America, Shoup Glacier, wildlife and other Prince William Sound attractions aboard the Lu-Lu Belle Glacier Wildlife Cruise or Stan Stephens Glacier and Wildlife Cruises. Interpretive exhibits at the Valdez Historical Museum include the gold rush, the 1964 earthquake, the trans-Alaska oil pipeline and the 1989 Exxon Valdez oil spill. A restored 1907 Ahrens steam fire engine, models of antique aircraft, and the original Cape Hinchinbrook lighthouse lens are also on display. Remembering Old Valdez Exhibit has a wonderful 1:20 scale Historic Old Town Model showing Valdez as it appeared in 1963, just prior to the earthquake. The Maxine & Jesse Whitney Museum at Prince William Sound College is a huge private collection of animal mounts, Native dolls, an Eskimo kayak, prehistoric artifacts and carved ivory. Well worth a stop. The Last Frontier Theatre Conference takes place at the Valdez Convention and Civic Center in June. Gold Rush Days, held in August, is an annual celebration that includes a parade, contests, game night and town fish fry. Sea kayaking is an ideal way to explore Prince William Sound. Sea kayak rentals and outfitters located at the Small Boat Harbor. Guided trips range from an afternoon paddle around Port Valdez to glacier day tours and camping tours: check with Pangaea Adventures. Go flightseeing, and see Columbia Glacier, spectacular Prince William Sound and the surrounding Chugach Mountains from the air. Crooked Creek Salmon Spawning Viewing Area offers a close-up look at spawning pink and chum salmon mid-July to early September. Dayville Road is a 5.8-mile paved side road (with bike trail) that leads to shoreside camping, picnicking, fishing and scenic views along Port Valdez, the 13-mile-long estuary at the head of Valdez Arm. See Waterfalls. From downtown Valdez, drive out the Richardson Highway 17.4 miles to see Horsetail Falls. A short distance beyond Horsetail Falls is Bridal Veil Falls. Both are favorite photo stops. Fish the annual halibut or silver salmon derbies and call Easy Freeze Inc to take care of your charter reservations and packing, freezing, shipping your catch, phone 907-835-4208.